It will save money for you by reducing the likelihood of slip and fall accidents and litigation at your work place and public places. At the home prevents a serious slip injury to loved ones on slippery floor. Assist managers, owners, employers with compliance with relevant OH&S and other floor safety regulations, standards and acts. A non slip floor surface will ensure that all of your staff, visitors and clients will have a safe and happy environment, increases productivity. For Commercial clients it is not only guaranteed for 2 years but during that period of time you also will have our floor safety risk management program supplied, at NO Additional Cost to You! 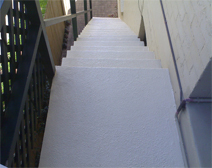 For Domestic clients � your home or residential investment properties - we guarantee the non slip surface for 5 years! Minimum or no disruption to your business / home during application. Our non-slip surface solutions suitable for almost all work areas work areas, including your office, entrances, factory floors, stairs, walking paths, workshops, canteens, restaurants, clubs, kitchens, bathrooms and change rooms, car parks, externally and internally. We can even make inside your swimming pools the stairs anti-slip. We have solution not only for all of your slippery tiled surfaces, but for concrete, vinyl, wooden, metallic and acrylic ones as well. When you are dealing with your local Floor Safety Representative, you are actually dealing with not a single person or company, but a member of the Global Floor Safety Network, which spans across continents and growing on a daily basis. Read more about FSMP� Advantage is Important to Me?